One of the things I (and most other expats) miss the most about home is food. Not just any food, each of us has our "fixes"…and for me, especially around my birthday, it is the time for DQ Ice Cream Cake and Girl Scout Cookies…specifically, peanut butter patties. On your birthday in Sweden, it is traditional for the birthday person to bring cake or other treats to their workplace/school/group event…in today's case for myself, that is for my hockey team! As such, yesterday and today I have been baking up a storm with this delicious homemade peanut butter patty bars (or tagalongs, if you prefer to call it that!) A word of advice? If you are on a diet, you should have never clicked on this post. Fortunately for me, calories don't count on your birthday so I am good to go! 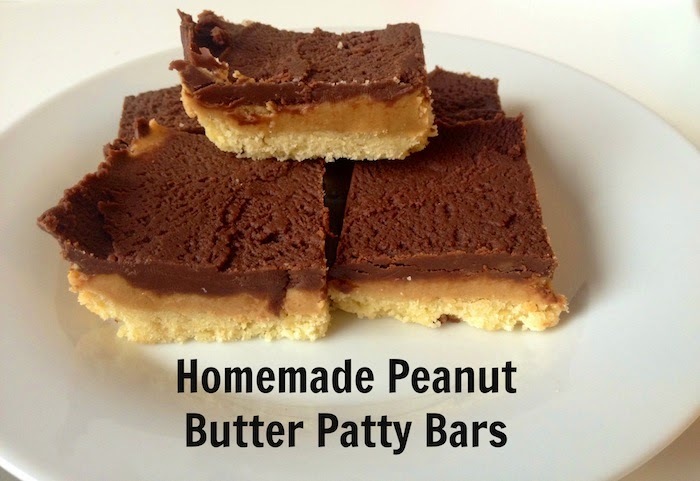 Without further ado, here is the recipe & instructions for these delicious peanut butter patty bars! Preheat oven to 350. Line a 9x9 pan or pie tin with aluminum foil, leaving an overhang around the edges. Combine all ingredients for shortbread crust in medium mixing bowl until a crumbly mixture forms. Press the mixture into the prepared pan, and then using a fork pierce several holes into crust to allow steam to escape. Bake 15 minutes or so, until crust just begins to turn golden. While crust is baking, mix together the peanut butter layer. As soon as you have removed crust from the oven, slowly spread the peanut butter layer over crust, as this will be easier to do while the crust is warm. Let cool for 30 minutes or so. Melt the chocolate chips and shortening until they can be stirred smoothly, then pour over the peanut butter layer. Chill one hour until set, then serve! If you aren't devouring these immediately, store them in the refrigerator but serve at room temperature. Make sure to use softened butter, not melted, for the shortbread crust. I like my crust to be a little crunchy, so I let it become golden throughout. This makes for a more crunchy (and realistic!) cookie. If you have trouble smoothing the peanut butter layer over the crust, place it in the warm oven for another minute or so to warm up the peanut butter. This will make it nice and easy to spread! Make sure to wait long enough to add chocolate layer so the chocolate and peanut butter layers do not mix. This won't affect the taste at all, simply results in better looking bars! Yummy! It is the same here in Iceland, the birthday person brings in the treats. Hope you have a wonderful birthday! Thanks Kiki! Its been a great day, and these bars were the perfect treat! Gingi, you should definitely try them out! Not quitee as good as the cookies back home, but almost! Happy birthday!! Those look sooo amazing, Tagalongs are one of my favorite girl scout cookies, so I will def be trying this recipe at some point. How did the Swedes like them? Our Swedish roommate last year had never had anything peanut butter/chocolate before and my mind was blown. I can't imagine a holiday without a Reese's peanut butter cup! Thanks Annessa! Tagalongs are always my favorite too, so I knew I had to try this. All of the girls on my team said they were really good (a couple asked for the recipe even!) so hopefully they were enjoyed. Most Swedes I know have had peanut butter (I think! ), but root beer and apple pie are a whole new story! My goodness that looks delicious! Thanks Christine! They were so good! 2. These treats look delicious! My birthday is later this week so I might need to make them for myself! Thanks Julie, and happy birthday to you as well! You'll have to let me know how these go for you- they were such a good treat! Happy Birthday! Peanut butter patties are my favorite! I would always buy them from my students and then inhale the whole box in a day or two. I'm going to have to try this recipe. Maybe I will wait a couple weeks until my birthday since the calories won't count ��. Oh man, these look amazing! I'm going to have to try them out. My mom actually just asked the other day if she should order some Girl Scout cookies to bring with her when she visits next month. I don't miss them quite as much as real cheetos, but I'll take 'em! But most of all, Happy Birthday!!! Oh wow, these look good! Sara, it is surprising how food is one of the things that we miss the most over here. I definitely agree with the "replacement" desserts, but sometimes you just can't beat your good old favorites!